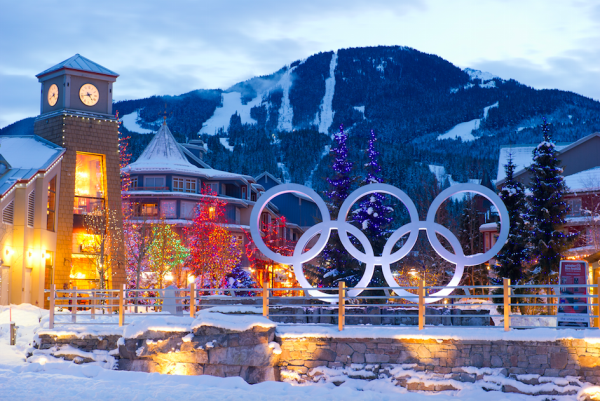 The highly anticipated Canadian winter kicks off in Whistler on 22 November, and huge numbers of Brits are once again expected to make the transatlantic journey in search of an epic adventure in British Columbia. The season runs until early May 2019 and once again several changes and improvements across the resort have been made during the summer months. The opening day of the winter season will not only see the first day of skiing and snowboarding, but also the unveiling of the much-anticipated 10-passenger Blackcomb Gondola. You’ll be able to stay warm and dry in the new gondola as it ascends from the base of Blackcomb Mountain to the top of the mountain adjacent to Rendezvous Lodge and the existing PEAK 2 PEAK Gondola. 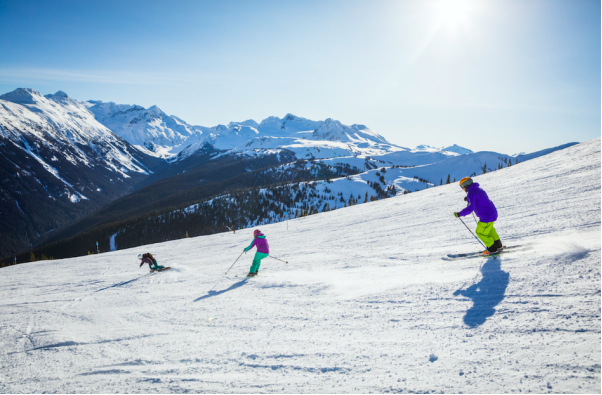 Together – the new Blackcomb Gondola, PEAK 2 PEAK Gondola and Whistler Village Gondola – form the first three-gondola connection in the world. 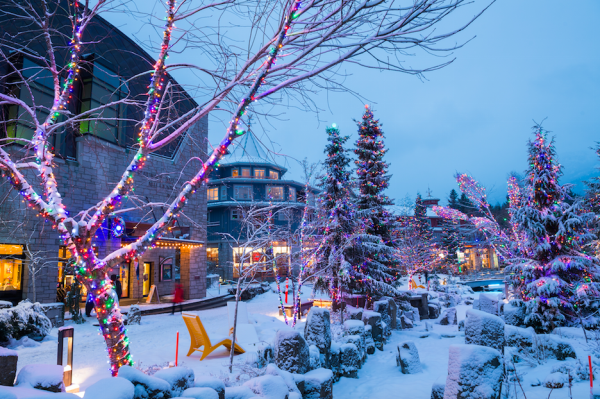 Arguably one of the most exciting additions to the Whistler dining scene this winter, The Blue Room is the result of an exciting collaboration between the Four Seasons Resort and Residences Whistler and Head-Line Mountain Holidays. In this unique experience, you’ll travel to the ice cave by helicopter before enjoying a guided tour of the spectacular natural ice sculptures. Once inside The Blue Room, Four Seasons’ Executive Sous Chef David Baarschers will serve up a five-course meal that celebrates the very best of British Columbia, all swilled down with a plentiful supply of Krug champagne. 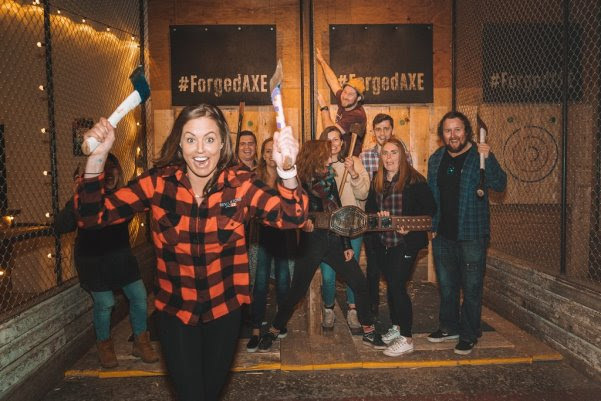 Forged Axe Throwing is giving après-ski a shake up for 2018/19 offering skiers and snowboarders the chance to enjoy something fun, raucous and highly competitive after a day on the slopes. Formerly just a way that lumberjacks used their quiet time (! ), Forged has brought this quintessentially Canadian pastime to the international masses. Think of it as a very exciting alternative to darts, as it involves hurling axes down an alley in the hope of sinking a bullseye. The team have all you need to get started and will even help perfect your technique and nail those trick shots. Don your finest plaid and prepare to get competitive! There’s a brand-new high-end retailer in town this winter, sure to prove an exciting and welcome addition for those fashionistas hitting the slopes. Jonathan+Olivia opened its doors in August 2018 and the store is the first multi-brand fashion lifestyle boutique in Whistler. Whether shopping for Christmas gifts, souvenirs or just wanting to freshen up your winter wardrobe, it’s well worth stopping by for a browse. Another new addition this winter, the Canadian Wilderness Adventures’ snowmobile and steak tour is sure to prove extremely popular. You’ll first explore Whistler’s stunning backcountry by snowmobile, winding your way up to a rustic log cabin on Sproatt Mountain. On arrival, you’ll enjoy a Canadian three-course steak dinner comprising of soup, Angus beef sirloin served with garlic mashed potatoes, seasonal vegetables and a delicious dessert. While foodies in Whistler are more than well catered for, there’s always room for vegetarian and vegan options. The popular Aura Restaurant launched its three-course vegan dinner this autumn offering up beautifully prepared, local produce accompanied by an extensive wine selection. The butternut squash farro risotto comes highly recommended and the menu is sure to be a treat even for meat-lovers who fancy an explosion of veggie flavour. While you’re there, grab a pre-dinner cocktail at Aura’s Cure Lounge. Head to Skier’s Plaza each Sunday night to witness a spectacular display of ski and snowboard skills as part of the legendary Fire & Ice Show. 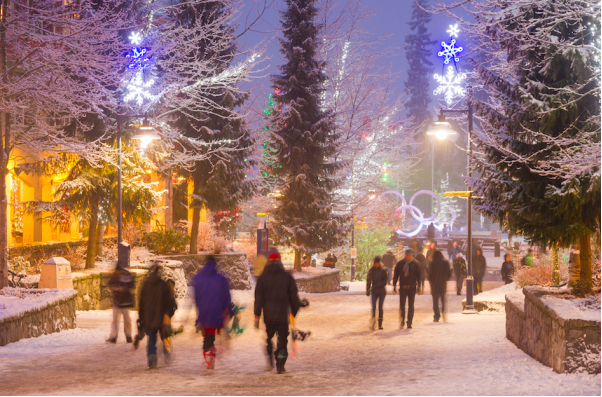 The event attracts some of Whistler’s best skiers and riders who jump and flip through blazing rings of fire accompanied by fire spinners, a DJ and fireworks. Wrap up warm, grab a hot chocolate and enjoy this electrifying evening of entertainment! This popular 60-seat mountain umbrella bar was completed for last winter allowing skiers and boarders to enjoy their natural surroundings from the comfort of a heated patio. For this winter, an extended wooden deck capable of hosting large functions and accommodating even more guests has been added. This mountain bar is the ideal place to enjoy a little afternoon refreshment and take in the breathtaking views. 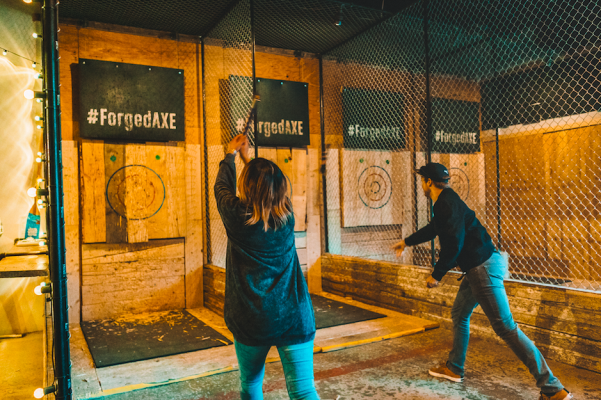 Seriously, you must try the axe-throwing!!! This entry was posted in Family Ski Holidays, Whistler and tagged forged axe, whistler. Bookmark the permalink.